Probably the most popular freeware & an email forensics tool, Free Thunderbird Email Viewer has exceeded the level of 1 billion downloads. The software is a quick and easy to use program that displays the email artifacts available within the MBOX files. The simple, intuitive UI and rapid but powerful mechanism of the Thunderbird file viewer make it capable of displaying the data available within the damaged or password protected MBOX files. At its launch, the Thunderbird MBOX Viewer was a revolution as it allowed the home users as well as the Forensics investigators to read and analyze the data available within the MBOX files irrespective of the email client in which it was created. The user-friendly GUI of the tool provides a preview of all the data available within the MBOX files with the option of analyzing every strand of present data. 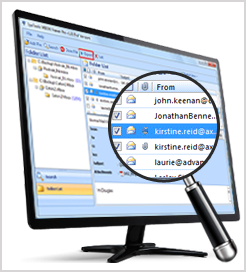 Being the most comprehensive forensically sound email examination tool, Thunderbird inbox file reader facilitates the forensic experts in analyzing the email message headers, bodies and attachments. Under the Normal Mail View option, investigators can easily view the crucial details of emails such as From, To, Cc, Bcc, Subject, Attachments, etc. The software proves to be a very helpful tool for investigators as it supports the MBOX files created in any known email clients such as Thunderbird, Gmail Takeout, Entourage, Apple Mail, Eudora, Mulberry, Sea Monkey, Spicebird, Pocomail, Mozilla-Mail, Opera Mail, etc. OS Support: – Windows 2000 / XP / Vista / Windows 7 / XP64 / Vista64 / Windows 7 64 / Windows 8 / 8.1 / 10. Thunderbird MBOX Viewer provides ease of visibility to users as it has been equipped with fabulous features of Horizontal and Vertical View modes. The Thunderbird File Viewer is compatible with all the versions of Windows OS. Be it forensic investigators, technocrats, or home users, any person with a Windows OS can utilize this tool. View and analyze the MBOX emails & attachments under the preview pane of the software. The forensic investigators can utilize the tool on MBOX files of any size. The software does not impose any file size limitation and has been successfully tested on files up to the size of 1 TB. The most suitable file format for presenting the email evidences in litigations is PDF. The complex algorithms embedded in the Pro version of Thunderbird inbox email file reader allows the conversion of MBOX file emails to PDF file formats. Further analysis of the Thunderbird emails can provide crucial information during cybercrime investigations. For Thunderbird’s mailbox forensics and investigations, a robust and sophisticated tool that can be utilized is Thunderbird Email Forensics Tool. The tool is an advanced technology utility supporting in-depth forensic analysis.